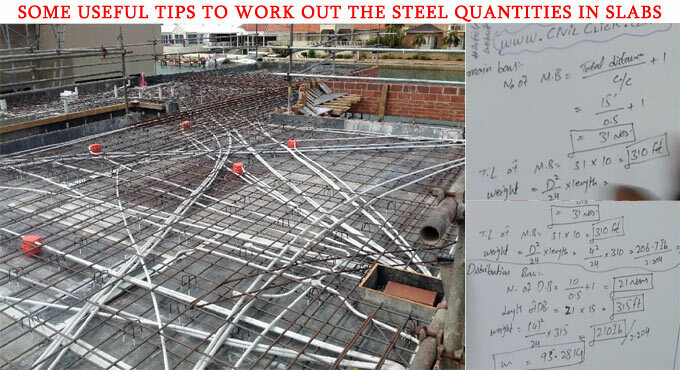 In this construction video tutorial you will learn the method for measuring the steel quantity in slabs in feets. Suppose, the length of the slab is 15 feet and width is 10 feet. The main bars and distribution bars diameter are taken as #4@6 c/c. The distance taken should be perpendicular to the main bar. Therefore, total length of main bars = 31 x 10 = 310 feet. D2 / 24 x length = (4)2 /24 x 315 = 210 lb or pound. To get more information, go through the following link.